Many people are under the impression that only the type 3 curly girls can do wash n go styles and achieve great definition. LIES. ALL LIES. Just because your type 4 curls are tiny little coils that zig zag, you can still get super defined results from your wash n go. If you’re not sure what your hair type is, check out the Know Your Hair Type page. If you fall in the 4b/4c category, here are five wash n go tutorials that garnered super defined results. Each one featured different products and different hair lengths. This just goes to show that it’s not just about the product, but the technique. 1 – LiveNaturallyLove. Just because your curls are small and springing, they can still be defined. 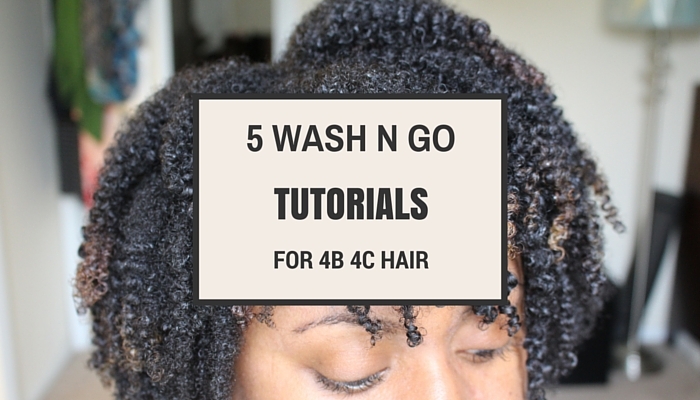 See how in this tutorial for 4B 4C hair. 2 – FloridaNatural83. Have a few different curl patterns and textures? No worries with this tutorial. This is effective for a variety of type 4 curls. 3 – NaturalCurliesTV. As our hair grows, it has different needs. For those of you who have longer tresses, here’s a tutorial just for you. 4 – SkinnyGotCurves. For the ladies with short hair or with a tapered cut, this wash n go routine is perfect for you. 5 – NaturallyGlamTV. In this tutorial, you’ll see a helpful technique specifically to help define the kinkiest of curls and coils. It’s not always about the product – sometimes it’s about the technique. Think Wash n Go’s Don’t Work on Nappy Hair? You are Wrong! Have you tried any of the products or techniques used in these tutorials for defining your curls?